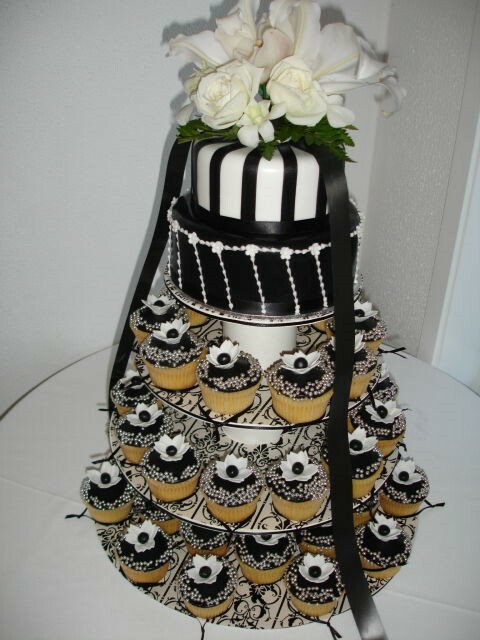 A sample of delicious, glamorous and unique wedding cupcake tower ideas in black and white. First we have a fab cupcake tower with pretty little cupcakes featuring black icing and white flowers with black centers. 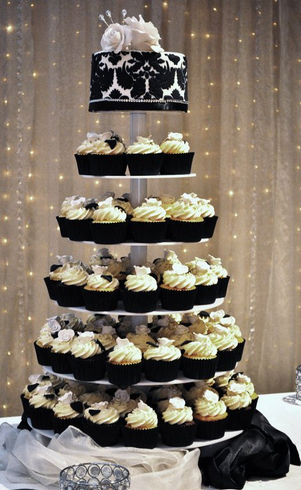 A beautifully designed cupcake tower, I love how the cupcakes are different in alternating rows some containing white sugar flowers and some containing black sugar hearts! very simple, unique and elegant! Black and white theme with black bows adorning the cupcakes and the mini cake on top! 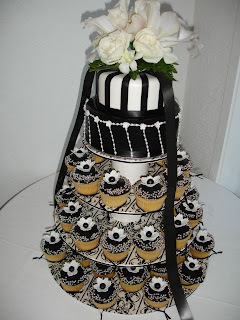 Cupcakes work well for a damask themed wedding. Using the damask pattern for the cake on top of the tower and following the black and white theme with the cupcakes in the bottom rows. 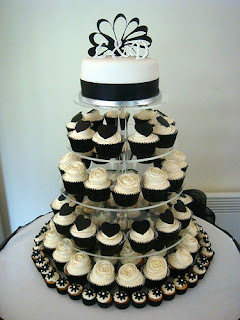 The following two images of black and white tuxedo cupcakes come from Skinny Mini's Couture Cupcake and Cake Creations. This is such a great idea and perfect for a wedding with a large number of guests. Added to the big beautiful cake in black white and red with damask patterns and a top hat topper are the little tux cupcakes. So original and yummy!